Study photosynthesis in a variety of conditions. Oxygen production is used to measure the rate of photosynthesis. Light intensity, carbon dioxide levels, temperature, and wavelength of light can all be varied. 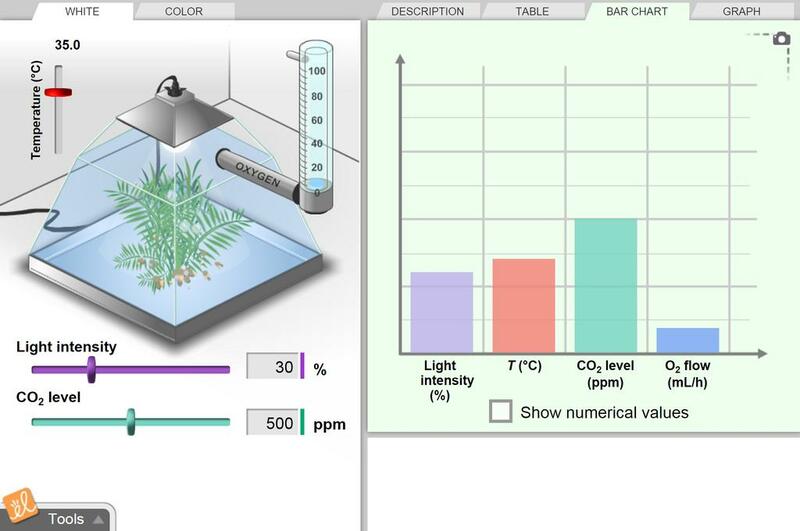 Determine which conditions are ideal for photosynthesis, and understand how limiting factors affect oxygen production. Residents of a large, urban high-rise complex are interested in building a rooftop greenhouse. A committe... (more)e has requested a feasibility study before beginning greenhouse construction. Your challenge is to design a small-scale greenhouse prototype that will maximize the rate of photosynthesis. This worksheet enables students to design an experiment based on the factors that impact the rate of phot... (more)osynthesis in a claim, evidence, reasoning model. This lesson plan implements the Smarter Science Inquiry Framework on the photosynthesis Gizmo. Simple lesson to discuss a great connection between Biology and Physics. I made a small change in page 2 question1 to pose a challenge for the students to try and balance the equ... (more)ation. They can use manipulatives to figure out the amount of each type of molecule. this it great it helps a lot for me. Excellent Gizmo for teaching the cause and effect of Photosynthesis as well as light and wavelengths. very useful website for biology students and above! This Gizmo is great for demonstrating the relationship plants have with light, O2, and CO2. Great Gizmo for teaching how to perform a controlled experiment! Students really get an understanding of wavelengths and pigmentation from this lab. Excellent representation of photosynthesis! Let them try and max out oxygen production. This gizmo is an amazingly well designed tool that illuatrates limiting factors in a clear concise way. It is exquisite! Can you predict the shape of the graph of oxygen production vs. light color (wavelength)?